It’s international bagpipe day! – For the fainthearted . . . It has been said that a gentleman is someone who knows how to play the bagpipes, but doesn’t. It is not something to say today, for 10th March is international bagpipe day. Bagpipes as a musical instrument take many and varied forms, and the music they produce is similarly diverse, but for most people the mention of the pipes will probably conjure images of mountainsides covered in heather, of stone castles, and of kilted pipers whose music cuts through the pure Scottish air. If music speaks to something deep and non-rational within our emotions, then no instrument delves deeper than the bagpipes. The history of the pipers during the First World War is one that might surprise those accustomed to the rational and the scientific. The Scottish regiments did not go into battle led by a piper because he was an interesting part of their cultural tradition. During the Great War, some 2,500 pipers served on the frontline, more than six hundred of them losing their lives. The Scottish commanders would not have risked so many lives without believing that there was something in the music that had the power to transform those men; that kilted soldiers of the piper’s battalion would leave the mud and stench of their trenches and head into the hell of shells and bullets, and blood and wire because their piper was walking ahead of them, the sound of his music adding an almost surreal element to the reality of conflict on the Western Front. 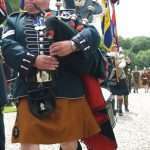 If one was cynical about the quality of bagpipe music, if one was inclined to disagree with the idea of music as having physiological power, then accounts of those highland regiments would quickly dispel any doubts. The bravery of the pipers themselves must have been extraordinary, how many people would have contemplated going “over the top,” not to engage in armed combat, but to play musical tunes that had been passed down through the generations? 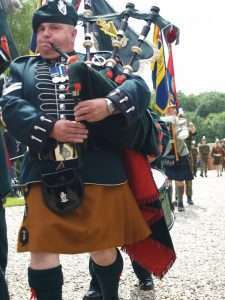 Having attended numerous ceremonies and commemorations, often with full military bands, there is no moment more moving than a single piper standing at a remove from the gathering with the strains of Thomas Moore’s “Oft in the stilly night” filling the air with sound. Recognition of the power of the pipes to transform serious moments perhaps leads to a more serious perception of their musical quality. The bagpipes played badly can be an unpleasant aural experience, but anyone who has to endure many high street buskers will know that most instruments played badly make uneasy listening. So enough jokes about bagpipes, at least until tomorrow.